It's a story we've seen all too many times. A famous athlete divorces his wife either during his playing career, or just a few years removed from it while the endorsement opportunities are still rolling in. The athlete gets tagged for child support and/or alimony payments that are in line with a level of income that dwindles significantly within a few years. The famous athlete then gets way, way behind on those payments. Toss in a hard-partying lifestyle, way too many appearances at way too many pathetic public events, and you have the case of Basketball Hall of Famer Dennis Rodman. Rodman is behind in his payments and faces a court hearing Tuesday in Orange. He faces up to 20 days in jail for failure to pay spousal and child support, according to an attorney for his ex-wife. As of March 1, Rodman, 51, owed $808,935 in back child support for the 9- and 10-year-old children that he had with his third wife, Michelle Rodman, said her attorney, Jack Kayajanian, in court documents. Rodman's attorney, Linnea Willis, did not specify in the documents what she meant by "sick." It's unclear if Dennis is suffering from some sort of malady, is broken up by the burden of his debts, or if she's referring to the "well-documented drinking problem" his manager told ABC News about on Tuesday. What is clear is that this is just sad, sad, sad. The former Defensive Player of the Year and seven-time rebounding champ really only had one highly salaried season as a player even by the relative salary definitions of his era. He was one of the lower-paid players on his team until 1996-97 before making just under $9 million (listed at $9 million, but he lost a chunk of that due to an 11-game suspension) during his second championship run with Chicago. The next season he made half of that in an incentive-laden contract, because the Bulls were wary of his behavior. 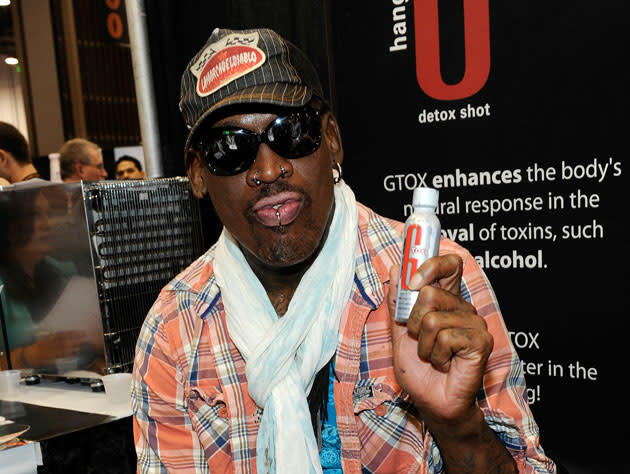 Dennis has made no attempt to hide his soiree-hopping, party boy lifestyle; but it should be noted that for every tacky body spray launch or vodka bar appearance Rodman struts into, he's being compensated for his time. These are paid appearances, even if Dennis is running on a D-list just above "Hobie" from Baywatch these days. This isn't to tell you that Dennis isn't blowing his money at these shindigs, but it's also not as if you have to think of the children every time you see him and his Ed Hardy cap on a red carpet somewhere. The ex-wife in question, Rodman's third, apparently listed her monthly living expenses as $17,000 a month at the time of the divorce in 2004. Dennis was four years removed from his last stint as a player, a brief run with the Dallas Mavericks, at the time. She is also requesting attorney fees as she attempts to recoup the money Rodman legally owes her.